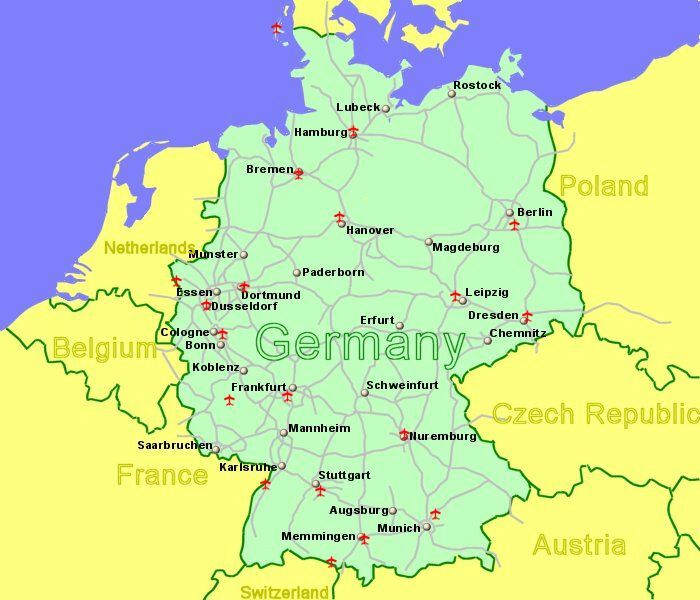 Being centrally positioned in Europe, Germany borders more countries than any other European country, runs from the North and Baltic seas south to the alps, and is crossed by three of Europes most important rivers, the Rhine, Danube and Elbe. You will find a varied landscape, ranging from flat lowlands to the north east, to the forested uplands of central Germany, and the Black forest and Alps in the south. Germany has vibrant cities with amazing architecture, pulsating nightlife, enchanting medieval villages and traditional wine making areas. You might even hit on the odd beer festival, or perhaps take a trip on the Rhine - Germany has a lot to offer. Germany is a member of the European Union and the currency is the Euro. Germany is also a Schengen country. 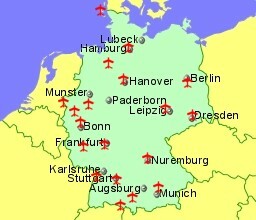 Located 24Km South East of Berlin, and the main airport for the city. Located 8Km North West of Berlin. Located 3Km South West of the historic port city of Bremen. Located 15Km South East of Cologne, the 4th largest German city, on the river Rhine. Located 10Km East of Dortmund, in the Ruhr area of North Rhine-Westphalia. Located 9Km North of Dresden, in the east of the country. Located 8Km North of Dusseldorf, the capital city of North Rhine-Westphalia. Located 10Km west of Kirchberg, 120 Km west of Frankfurt! Located 9Km South West of Frankfurt, the fifth largest city in the country and its financial centre. Located 6Km east of Friedrichshafen, on the shores of Lake Constance, close to the Austrian and Swiss borders, and ski resorts. Located 8Km North West of Hamburg, the second largest city in the country and its main port. Located 11Km North of Hanover, the capital city of Lower Saxony. Located On the island of Usedom, north east Germany, against the Polish border. Located 40Km South of Karlsruhe, 12Km West of Baden-Baden, near the French border. Located 12Km North West of Leipzig, 16Km South East of Halle. Located 27Km North East of Munich, the third largest city in the country, Bavaria. Located 7Km North of Nuremburg, Bavaria. Located 13Km South of Stuttgart, near the Black Forest, south west Germany. Located on the island of Sylt, of the northern coast of Germany, near the Denmark border. Located 3Km South West of Weeze, North Rhine-Westphalia, 78Km North West of Dusseldorf.